Hampshire Fire & Rescue Service have been crowned National Extrication Champions, beating 44 other teams at the UK Rescue Challenge, the largest competition ever staged in this country. Makita power tools play a vital part in Road Traffic Accident extrication and rescue operations and have been the choice of Hampshire Fire & Rescue Service for many years. Extrication is the skilled method of rescuing injured motorists, often from the tangled remains of their cars following a serious accident. It is essential to have a procedure that immediately stabilises and secures the vehicle and then quickly determines the best method of releasing the injured person whilst avoiding further additional injury. Extrication competitions have expanded in recent years to test and highlight these skills and techniques and this has encouraged Fire & Rescue Service to enhance training and improve abilities. Participating in competitions hones these techniques which is of great value in rescuing injured motorists from life-threatening circumstances resulting from road traffic accidents. The equipment and tools used in this skilled operation have also been refined and Makita power tools are a key element in the rescue plan. The UK Rescue Challenge, hosted by Merseyside Fire & Rescue at a specially constructed event site at the Albert Dock in Liverpool, saw 600 fire-fighters take part. In addition to winning the overall National Champions title, the Hampshire team also won the best Medical Team and the best Technical Team in the Extrication Challenge. 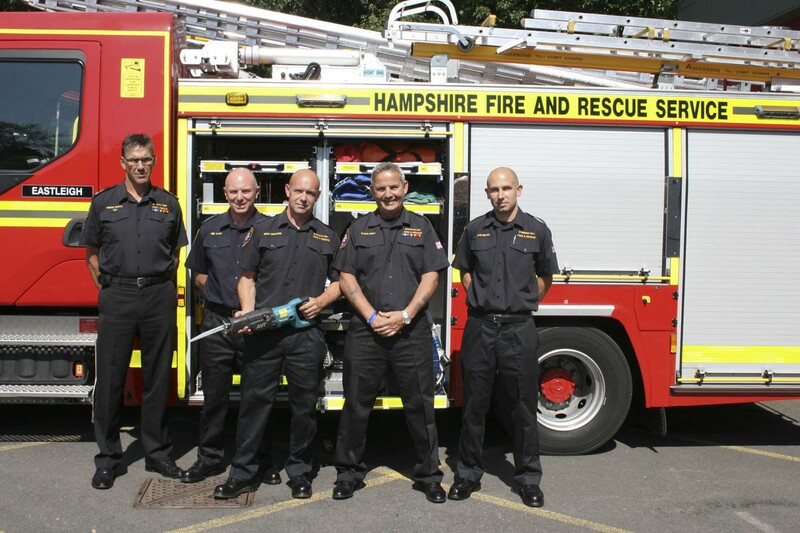 Hampshire Fire & Rescue – and many other Brigades in the UK – use 110 volt, cordless and petrol powered Makita tools for rescue operations. The inventory on front line appliances includes 110v AVT and 18v Lithium-Ion battery reciprocating saws and Makita cutting blade; 110v 230mm grinders for cutting through steel and 18v LXT combi drills. In addition, the Makita DPC 8132 16 inch petrol disc cutter and demolition cutting blade is carried on the Heavy rescue tender. Hampshire is currently evaluating the new Makita BTW450 ½ inch drive impact wrench that can generate up to 440Nm of torque, and the new BJS130RFE steel cutting shear.